Over the years, I have been asked many times by people why one would want to change the gears in their axles. Until you've studied the subject it can seem a little overwhelming. But really, it's not that complicated. The following page gives an introductory description of how the parts work and why you may need to change them. There's a lot of detail missing here but this will get you started. It helps to start by looking at what the gears inside the differential actually do. In a nutshell, the gears in the axle take power supplied from the driveshaft and sends it out through the axle shafts to the wheels. It does this by using two gears together. The two gears are called the ring gear and the pinion gear. You can see in the pictures a typical ring and pinion gear, both by themselves and as they are installed in the axle housing. The ring gear looks, well, like a ring. 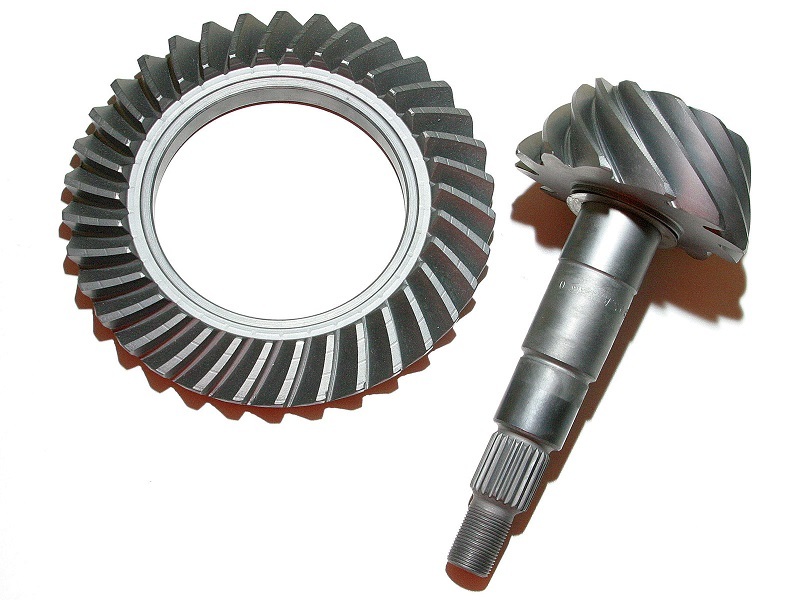 The pinion gear is the other one. The driveshaft connects to the shaft on the pinion gear. When the driveshaft turns, the pinion gear spins the ring gear and that makes the axle shafts turn and that's what spins the wheels. Eagle eyed readers will notice that there is a differential betwen the ring gear and the axle shafts. The differential and how it works merits its own discussion. The axle gears have a ratio. That ratio tells you how many times the driveshaft will make a complete rotation for every one full rotation of the wheel. So if you have 4.10 gears, that's a 4.10:1 ratio, which means that for every one full rotation of the tire, the driveshaft will rotate 4.10 times. The ratio is calculated by dividing the number of teeth on the ring gear by the number of teeth on the pinion gear. As an example, if there are 41 teeth on the ring gear and 10 teeth on the pinion gear, you would have 41/10 = 4.10, giving you the 4.10 ratio. So why change the gears? Think about what happens when you change the tire size. A bigger tire will go farther down the road for each time it makes one complete revolution. So if you bump up the tire size without changing the axle gears, your driveshaft will be turning slower when you're driving down the highway. That means your engine will be turning slower. If your engine is turning too slowly, it won't make very good power and your performance (and even fuel economy) can suffer. So to compensate, you change the axle gears. Bigger tires means higher numbers for axle gears. By changing the axle gears to match the tire size change, you put the engine speed back close to where the factory put it and you get back to factory-like performance. So why does the factory offer different gear ratios for vehicles with the same tire size? So they can make the vehicle perform in a specific way. Gears with lower numbers are called "taller" gears. They are given this name because a vehicle with taller gears can run faster on the highway (or race track) before the engine reaches its red line. Gears with higher numbers are called "shorter" gears. Vehicles with shorter gears will reach red line at lower speeds. Taller gears tend to give you better fuel economy (to a point) but reduce your acceleration. Shorter gears improve acceleration at the cost of fuel economy. Switching to bigger tires has the same effect as putting in taller gears. Putting in smaller tires has the same effect as putting in shorter gears. Shorter gears are preferred for rock crawling because they let you go much slower over the rocks. Taller gears are preferred for mud bogging because you need wheel speed to keep the tires clean and biting in the mud. Road racing cars might have taller gears to really get moving on the long straights while short track cars would never reach top speed before getting to the next corner so they would have shorter gears to get better acceleration coming out of the corners. When changing gears in a 4x4 vehicle, it's very important to remember that you must change the gears in both axles at the same time. The transfer case is designed to work when both driveshafts are spinning at the same speed, or at least very close. Even an all wheel drive transfer case that allows the shafts to spin at different speeds make that allowance only for going around corners on the road. 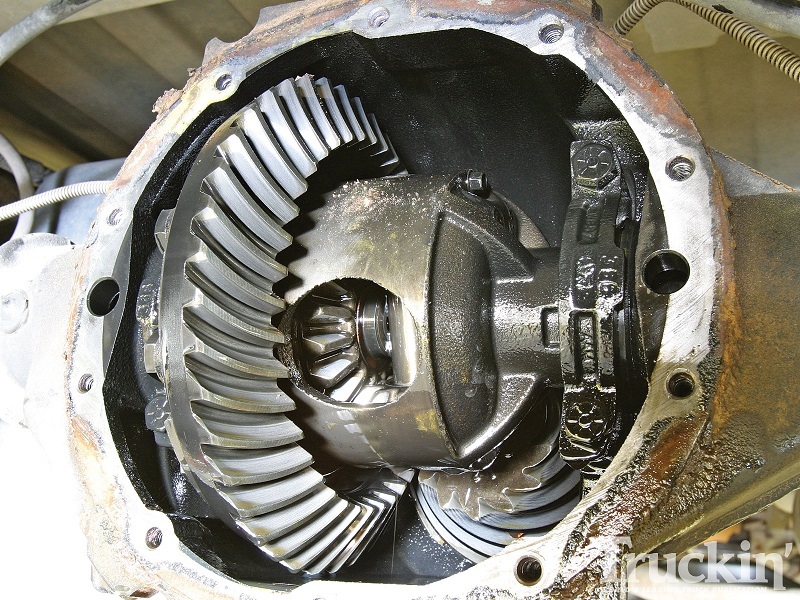 If there is a significant difference between the speeds of the driveshafts for an extended length of time the parts in the transfer case will break. For a part time transfer case, you'll snap a universal joint, axle shaft, yoke, or even twist the driveshaft into a pretzle. For a full time transfer case or all wheel drive transaxle, you'll wear out parts within a couple of miles that would otherwise last for tens of thousands of miles. Another question that comes up is what you do when the gear ratios don't match exactly. The simple answer is that you just need to get them close. As long as there's less than a 1% difference between the ratios, they're considered "close enough". If your front axle only has 4.11 gears (37 ring gear teeth and 9 pinion teeth) but your rear axle has 4.09 gears (45 ring gear teeth and 11 pinion teeth) the ratios don't match exactly. But because there's only 0.02 difference between them they're considered close enough to run safely. Old Gear Ratio × New Tire Size ÷ Old Tire Size = New Gear Ratio. 3.73 × 37 ÷ 32 = 4.31. Trouble is, nobody makes 4.31 gears for the Jeep axles. You can get 4.10's, 4.56's, 4.88's and 5.13's. So which do you choose? The rule of thumb is that you always round up. The biggest reason you would want to do that is because larger tires are harder to move. Not only are they heavier, they're typically wider so they have a larger contact patch on the pavement and they offer more rolling resistance. It takes more to push it down the road. In this case, you'd pick 4.56 gears to end up with performance that's close to where the factory put it. A lot of people will take it a step farther and go to 4.88 or even 5.13 gears depending on what they want to get out of their Jeep. But 4.56 gears would be the closest to factory performance. Jeep® is a registered trademark of of Chrysler Group LLC.